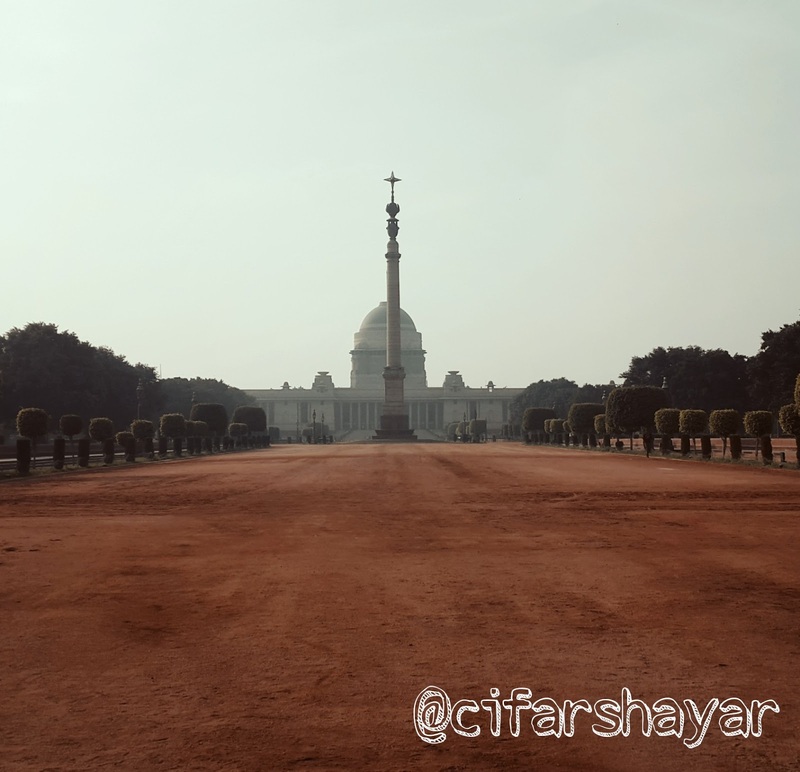 Our next stop after museums was a corridor which leads to an open area called the heart of Rashtrapati Bhavan. At the heart area bust of Edwin Lutyens the architect of Rashtrapati Bhavan is placed opposite to this on other side of that open area stands a statue of Mahatma Gandhi inaugurated by current president Pranab Mukherjee after completing one year in office. This open area give the nearest view of RB dome. 'Edwin Lutyens loved geometrical shapes which he mostly used in designing this building. Apart from geometrical shapes you will notice pillars and chandeliers have bells in their design these are called silent bells. He created these bells to denote India as Britisher's mute colony,' our guide said and took us from a 20m high door to see dining hall. She told us about the light controlled dining etiquette of that hall in which butlers act silently through signals of light by head butler. In front of dining hall we have Ashoka Hall which is used to click pictures of special guests in the president house, this hall has beautiful pictures on its ceiling. During British rule this hall was used as ballroom and hence it has wooden flooring. Then we saw meeting hall where president meets foreign delegates, Library having collection of rare books and finally Darbar Hall where oath ceremonies of PM's, Chief Justice of Supreme Court and Padma award functions were held. In darbar hall behind the president's seat stands Gupta period Budhdha statue which aligned in a way to stand at top of India gate. A central line passed from this hall which divide RB in two equal halves and a British period chandelier weighing 2000 kg is hanged to its ceiling. This room is right below the dome of RB. 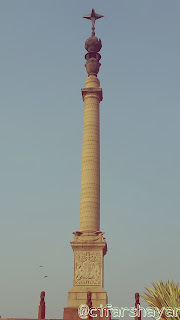 Jaipur Column gifted by King of Jaipur, this also the place where RB's foundation stone was laid. She told us about some rare paintings hanging on the wall and about some things placed there which were gifted by different nations. This ended our visit to Presidential Estate. Presidential Estate is like a city in itself with Golf course, swimming pool, petrol pump, Mughal Gardens, residential area for staff, farm land for growing vegetables, etc. After the end of tour our guide showed us things which Britishers left incomplete sadly they are incomplete till now. When I hear about building of new Parliament I wonder how they would create such brilliant structures when they are unable to complete the things left unfinished by them. Only there policy of divide and rule is superbly adopted and continued well by Indian politicians in the course of history. Rashtrapati Bhavan is build with red stone and marbles, there is no use of iron in it. Its a marvelous structure one must visit as an Indian in his/her lifetime. More area should be shown to visitors and there should be arrangement for photographs at least a group photographer in front area of Rashtrapati Bhavan as a remembrance. But the memories you carry in your mind will always remain with you. I feel privileged to have that opportunity and hope to visit again to that place. I recommend RB visit to everyone.